Use fasciocutaneous flaps to provide coverage when a skin graft or random skin flap is insufficient for coverage (eg, in coverage over tendon or bones). Orient the flap along the direction of the supplying vessel; knowledge of the direction or orientation of the fascial plexus, the fasciocutaneous perforators, and the fascial septum is required. They are simple to elevate, quick, and fairly reliable in healthy patients. Because they are less bulky, fasciocutaneous flaps are indicated when thinner flaps are required. Unlike with muscle flaps, no functional loss occurs. Although these flaps provide a donor site in areas that are not available for random axial flaps, significant donor site morbidity can be associated with these flaps. Fasciocutaneous flaps are not as resistant to infection as muscle flaps. Monitoring flap failure occasionally can be difficult. Ponten first described fasciocutaneous flaps in 1981. Previously, most lower limb flaps were based on the concept of random skin flap design, thus were limited by a certain length-to-width ratio (usually 1:1 in the lower extremity). Ponten flaps had length-to-width ratios as great as 3:1. These flaps have been referred to as Ponten superflaps. Type A is supplied by multiple fasciocutaneous perforators that enter at the base of the flap and extend throughout its longitudinal length. The flap can be based proximally, distally, or as an island. Type B has a single fasciocutaneous perforator, which is of moderate size and is fairly consistent. This flap may be isolated as an island flap or used as a free flap. Type C is based on multiple small perforators that run along a fascial septum. The supplying artery is included with the flap. It may be based proximally, distally, or as a free flap. Type D is an osteomyocutaneous flap, similar to Type C but including a portion of adjacent muscle and bone. It may be based proximally or distally on a pedicle or used as a free flap. Cormak and Lamberty also introduced a new classification based on clinical applications. Type A has a fascial plexus, Type B has a single perforator, and Type C has multiple perforators and a segmental source artery. For more information on the classification of all types of flaps, see Medscape Reference article Tissue Flap Classification. Circulation to a fasciocutaneous flap is based on the prefascial and subfascial plexuses. There are also arterial plexuses at the subdermal and subcutaneous levels. These plexuses are supplied by regional arteries that may enter the deep fascia through an underlying muscle (musculocutaneous), through the septum between underlying muscles (septocutaneous), or through a direct cutaneous branch. Often, more than one source of blood supply to a particular area of skin or a particular muscle is present. If one of these arteries is ligated, the skin and fascia continue to receive blood supply from an alternative source. The arteries generally are accompanied by paired venae comitantes and are reasonably consistent in their location. 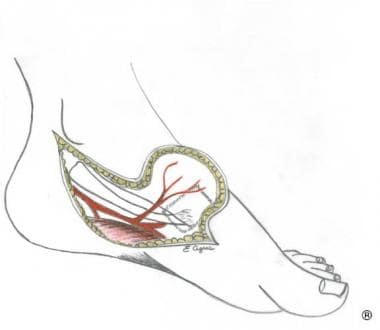 In the extremities, many perforators pierce the septa between long slender muscles, while musculocutaneous perforators tend to supply the skin over the broad flat muscles of the trunk. Because of the directionality of the fascial plexus, particularly in the extremities, the orientation of the flap is important. The temporoparietal flap (see the image below) is one of the most versatile flaps in the head and neck region. It may be used for coverage of the ear, orbit, anterior cranial base, and upper two thirds of the face. Often, it is used as a free flap when vascularized tissue is needed with minimal bulk. The flap can be used with or without the skin. In addition, it can be raised with the auriculotemporal nerve when sensation is required. Vascularized bone may be obtained by including a strip of parietal bone. During dissection, take precautions to avoid injury to the frontal branch of the facial nerve, which is located along a line 0.5 cm below the tragus to a point 1.5 cm above the lateral brow. 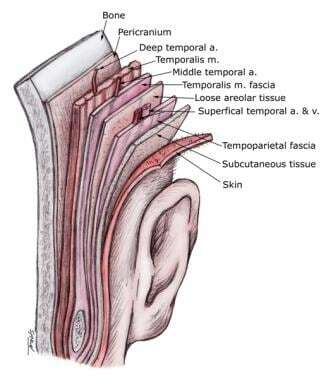 The temporoparietal fascia is located superficial to the deep temporal fascia. It is continuous with the galea superiorly and with the superficial musculoaponeurotic system inferiorly. Its blood supply is the superficial temporal artery, which lies on the superficial surface of the fascia. The flap may be extended to include the galea along with the temporoparietal fascia. In addition, it may be elevated with the deep temporal fascia, creating a double-layered vascularized fascial flap. Releasing the fascia from the zygomatic arch can increase the pedicle length, and the superficial temporal vessels can be mobilized to the level of the parotid gland. The scapular or parascapular flap can be used to cover hand or stump wounds. It is not a sensory flap but it does not sacrifice any major vessels. The area of the flap may be pre-expanded with tissue expansion techniques to create a larger skin paddle for coverage. The disadvantage is the scar, which occasionally is unsightly. The image below depicts a defect reconstructed with the scapular free flap. The scapula flap is located between the spinous processes and the long head of the triceps, situated directly over the scapula. It can extend from the scapular spine to 3 cm above the angle of the scapula and 2 cm from the vertebral column to the posterior axillary line. It may be up to 10 cm in height and 13 cm in width. The parascapular flap can extend from the pedicle superiorly with a length of 25-30 cm, with the main axis along the lateral border of the scapula. The blood supply is the circumflex scapular artery, which is a branch of the subscapular artery off the axillary artery. The artery is 5 cm long, with an external diameter of 4.5 mm. It passes posteriorly through the triangular space, which is bordered by the long head of the triceps laterally, the teres major inferiorly, and the teres minor superiorly. The artery divides into a transverse branch, which supplies the scapular flap, and a descending branch, which supplies the parascapular flap. The lateral arm flap is located on the lateral aspect of the upper arm and is supplied by the posterior radial collateral artery. The vessel is 0.75-1.5 mm in diameter, and the pedicle is 8 cm in length. The flap can be designed with a 6-8 cm width, which allows primary closure of the wound. If the width is larger, the donor site requires grafting. During dissection of the flap, take precautions to avoid injury to the radial nerve. The flap can be used as a free flap or in a retrograde fashion for coverage of elbow defects. This flap also can be designed as a sensate flap based on the antebrachial cutaneous nerves of the arm and forearm. Occasionally, muscle, bone, or tendon is incorporated into the flap. The medial arm flap is based on the skin of the medial arm, thus has the advantage of creating a hidden scar at the donor site. The superior ulnar collateral or branches of the brachial artery provide the blood supply. The medial brachial cutaneous nerve innervates it. Elevation of this flap can be tedious. Most often, it is used as a free flap or as a flap for elbow coverage. The posterior arm flap is based on the skin of the midposterior upper arm. Blood supply is via branches of the brachial or profunda brachial artery. The pedicle is 6 cm long and the diameter is 1.0-2.5 mm. The nerve supply is the posterior brachial cutaneous nerve. Use this flap for free tissue transfer and local coverage. The radial forearm flap was described in China in 1978. It is supplied by the septocutaneous perforating branches of the radial artery in the forearm. The skin flap is designed on the volar forearm (see the image below) and can extend from the wrist crease to the elbow; it may reach dimensions of 10 cm x 40 cm. The diameter of the artery is 2.5-3.0 mm. Confirm patency of the ulnar artery and superficial palmar arch prior to using this flap. Use this flap for coverage when a thin flap with a long pedicle is required. To provide sensation, the flap can be harvested with the superficial radial nerve or the medial or lateral antebrachial cutaneous nerves. This flap is particularly useful as a free flap in head and neck reconstruction. In addition, it is used frequently for coverage in the hand based on retrograde flow. One disadvantage is the conspicuous donor site. During dissection, careful preservation of the paratenon over the tendons is necessary for later skin grafting if the dimensions of the flap preclude primary closure. This flap has been described with a segment of radial artery to create a vascularized bone graft and has been described as a fascia-only flap. The ulnar artery forearm flap, located on the ulnar aspect of the forearm, is based on the septocutaneous perforators of the ulnar artery, which has a diameter of 2.5-3.0 cm. It is similar to the radial forearm flap and can be dissected to include bone, nerve, or a musculotendinous unit. Use this flap as a free flap or as a pedicled flap for coverage of the upper extremity. In addition, it may be used as a vascular conduit or fascia-only flap. The posterior interosseous artery flap is a Type B fasciocutaneous flap based over the dorsal aspect of the forearm between the radius and ulna. It is supplied by the posterior interosseous artery branch of the common interosseous or directly from the ulnar artery. The pedicle is 5 cm long, with a diameter of 1.5 mm. It can cover defects of the elbow, wrist, forearm, and hand. McGregor and Jackson popularized the groin flap in 1972. Usually, it is designed centered over the superficial circumflex iliac artery. Consider it a Type A fasciocutaneous flap, since it includes the fascia of the sartorius and the Scarpa fascia. Its pedicle is 2 cm long and 1.5 mm in diameter. The groin flap remains extremely useful for coverage of upper extremity defects, either as a pedicled flap or free flap. In addition, it is used for abdominal and perineal wounds and as a free flap in head and neck reconstruction. In the thigh, the lateral and medial thigh flaps are Type B fasciocutaneous flaps based on the perforating branches of the profunda femoris and superficial femoral arteries, respectively. Use the lateral thigh flap for coverage of ischial and trochanteric defects. Its pedicle is 5-6 cm long, with a diameter of 1-1.5 mm. It can be designed over the lateral thigh between the greater trochanter and knee with dimensions of 7 x 20 cm. Use the medial thigh flap, which is 10 x 20 cm and has a pedicle of 2-4 cm with a 1.5 mm diameter, for wounds of the abdomen, groin, and perineum. The anterolateral thigh flap is located between the rectus femoris and vastus lateralis, measures 12 x 20 cm, and is a Type B and C flap based on septocutaneous and musculocutaneous perforators of the lateral circumflex femoral branch of the profunda femoris. Its pedicle is 12 cm, with a diameter of 2 mm. Use this flap for trunk, groin, abdomen, and thigh wounds. The posterior or gluteal thigh flap is based on the skin of the posterior thigh overlying the biceps femoris muscle. Its dimensions are approximately 12 x 30 cm. Its blood supply is the descending branch of the inferior gluteal artery, identified halfway between the trochanter and ischium. This flap frequently is used to cover ischial pressure ulcers. It may be raised with the posterior cutaneous nerve of the thigh for a sensate flap for buttock and perineal wounds. The saphenous flap is a Type A fasciocutaneous flap based on the saphenous artery branch of the descending genicular branch of the superficial femoral artery. The pedicle is 5-15 cm long with a diameter of 1.5-2 mm. Design the flap over the distal medial thigh so that it measures 7 x 20 cm; use it for knee wounds. The anterior tibial artery flap is a Type B fasciocutaneous flap located on the anterolateral aspect of the leg between the knee and lateral malleolus. Based on the septocutaneous branches of the anterior tibial artery, it can measure 6 x 18 cm. The pedicle is 3 -4 cm in length and has a diameter of 0.3-0.8 mm. This flap most often is used for coverage of leg wounds around the tibia. It can be used as a sensory flap based on the superficial peroneal nerve. Most of the flaps of the leg can be designed as superiorly based, distally based, island, or turnover flaps. The peroneal artery flap is a Type B fasciocutaneous flap based on the lateral leg over the fibula extending from the head of the fibula to the lateral malleolus. This flap can measure approximately 10 x 20 cm. 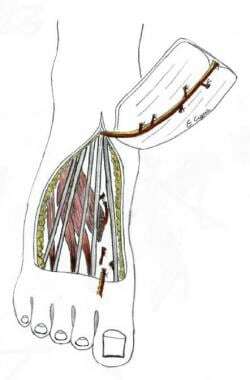 Septocutaneous perforators of the peroneal artery supply its blood. The pedicle is 3 cm long and has a diameter of 0.5 mm. It can be used for coverage of defects of the middle and lower third of the leg. The superficial peroneal nerve may be included with a segment of fibula. The posterior tibial artery flap is a Type B fasciocutaneous flap designed on the medial aspect of the leg from the knee to the medial malleolus. Based on septocutaneous perforators of the posterior tibial artery, it can be 6 x 18 cm. The pedicle is 2-4 cm long and has a diameter of 0.5-1 mm. It is used for coverage of defects of the middle and lower third of the leg and can include the saphenous nerve for sensory innervation. The sural artery flap is a Type A fasciocutaneous flap based on the sural artery direct cutaneous branch of the popliteal artery. The pedicle is 3 cm long and has a diameter of 1.4 mm. It is located between the popliteal fossa and the midposterior leg between the medial and lateral heads of the gastrocnemius muscle. The flap can measure 15 x 6 cm and may include the sural nerve as a neurosensory flap. Use this flap for wounds around the knee and upper leg. The dorsalis pedis flap is a Type B fasciocutaneous flap based on the dorsal skin of the medial two thirds of the foot from the ankle to the toes. Its blood supply is from the septocutaneous perforators of the dorsalis pedis artery and first dorsal metatarsal artery. Its pedicle length is 6-10 cm, and its diameter is 2-3 mm. This flap can be used for defects around the ankle, foot, and lower leg, and it is often used as a free flap. See the image below. The medial plantar artery flap is a Type B fasciocutaneous flap located on the instep of the foot and based on the medial plantar artery. The pedicle is 12 cm long and has a diameter of 1.5 mm. 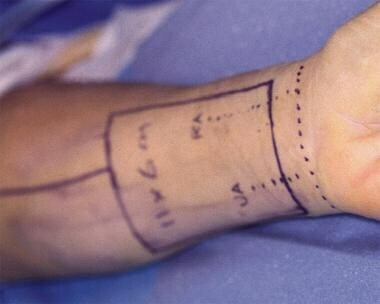 Use this flap for coverage of plantar foot and ankle defects. See the image below. 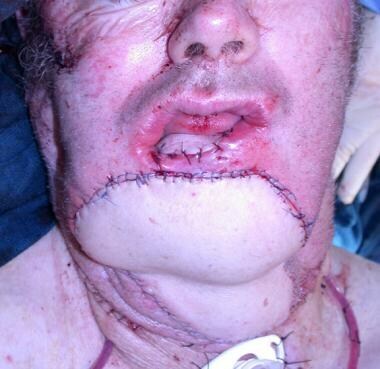 Fasciocutaneous flaps are subject to some of the same complications as any skin flap. In general, the flap design is important. Any technical error in flap design or harvest can cause either partial or complete flap ischemia or necrosis. Failure of the flap occasionally can be difficult to monitor. Infections also can occur, particularly since fascia is less resistant to infection than muscle. Donor site morbidity can be significant, especially with larger flaps. Hashimoto I, Abe Y, Ishida S, et al. Development of Skin Flaps for Reconstructive Surgery: Random Pattern Flap to Perforator Flap. J Med Invest. 2016. 63 (3-4):159-62. [Medline]. [Full Text]. Ponten B. The fasciocutaneous flap: its use in soft tissue defects of the lower leg. Br J Plast Surg. 1981 Apr. 34(2):215-20. [Medline]. Cormack GC, Lamberty BG. A classification of fascio-cutaneous flaps according to their patterns of vascularisation. Br J Plast Surg. 1984 Jan. 37(1):80-7. [Medline]. Tolhurst DE, Haeseker B, Zeeman RJ. The development of the fasciocutaneous flap and its clinical applications. Plast Reconstr Surg. 1983 May. 71(5):597-606. [Medline]. Lovie MJ, Duncan GM, Glasson DW. The ulnar artery forearm free flap. Br J Plast Surg. 1984 Oct. 37(4):486-92. [Medline]. McGregor IA, Jackson IT. The groin flap. Br J Plast Surg. 1972 Jan. 25(1):3-16. [Medline]. Zhong W, Lu S, Wang C, et al. Single perforator greater saphenous neuro-veno-fasciocutaneous propeller flaps for lower extremity reconstructions. ANZ J Surg. 2015 Mar 30. [Medline]. Dhamangaonkar AC, Patankar HS. Reverse sural fasciocutaneous flap with a cutaneous pedicle to cover distal lower limb soft tissue defects: experience of 109 clinical cases. J Orthop Traumatol. 2014 Sep. 15(3):225-9. [Medline]. [Full Text]. Chiu YJ, Liao WC, Wang TH, et al. A retrospective study: multivariate logistic regression analysis of the outcomes after pressure sores reconstruction with fasciocutaneous, myocutaneous, and perforator flaps. J Plast Reconstr Aesthet Surg. 2017 Apr 23. [Medline]. Ciresi KF, Mathes SJ. The classification of flaps. Orthop Clin North Am. 1993 Jul. 24(3):383-91. [Medline]. Hallock GG. "Microleaps" in the progression of flaps and grafts. Clin Plast Surg. 1996 Jan. 23(1):117-38. [Medline]. Hallock GG. Principles of fascia and fasciocutaneous flaps. Weinzweig J, ed. Plastic Surgery Secrets. Philadelphia, Pa: Hanley and Belfus, Inc; 1999. Hallock GG, ed. Fasciocutaneous Flaps. Cambridge: Blackwell Scientific Publications, Inc; 1992. Hwang K, Hwang JH, Jung CY, Won HS, Chung IH. Cutaneous perforators of the forearm: anatomic study for clinical application. Ann Plast Surg. 2006 Mar. 56(3):284-8. [Medline]. Koshima I, Ozaki T, Gonda K, Okazaki M, Asato H. Posterior tibial adiposal flap for repair of wide, full-thickness defect of the Achilles tendon. J Reconstr Microsurg. 2005 Nov. 21(8):551-4. [Medline]. Rohmiller MT, Callahan BS. The reverse sural neurocutaneous flap for hindfoot and ankle coverage: experience and review of the literature. Orthopedics. 2005 Dec. 28(12):1449-53. [Medline]. Serafin D. Atlas of Microsurgical Composite Tissue Transplantation. Philadelphia, Pa: WB Saunders; 1996. The authors and editors of Medscape Reference gratefully acknowledge the contributions of previous author Kerri M Woodberry, MD, to the development and writing of this article.